When Ryan looked at the Xperia X Performance last month, his verdict was that it had a nice display, decent specs, but deal breakers like the lack of a fingerprint scanner and the poor camera left a sour taste in his mouth. That was nothing though compared to the shock of the price of the phone. $700. There are many, many better phones selling for that much and even less, so Sony's value proposition just seems ridiculous. 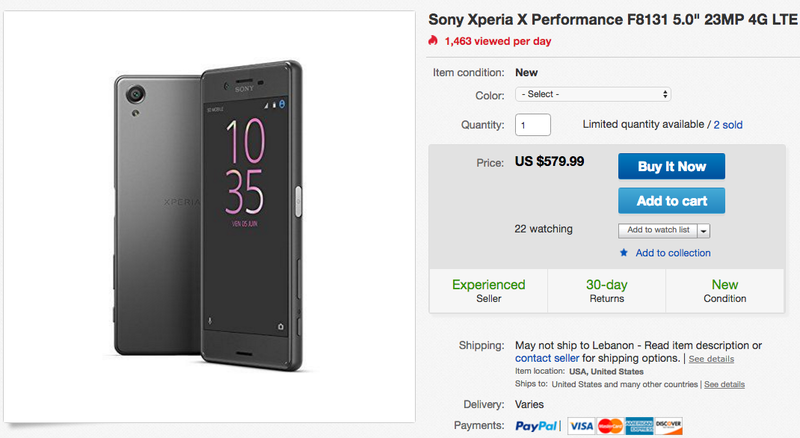 At a discounted price though, you could make a case for the X Performance. It does have a nice display after all, a solid build, a Snapdragon 820, IP68 water resistance (a bit of a rare feat still), 3GB of RAM, and if the camera's software is tweaked, it could yield good photos. How discounted though does it have to be for you to consider the phone? I think the line has to be drawn at the price of the Galaxy S7. If it's more expensive, then it makes very little sense to get it. And that's why we're here talking about this deal. An eBay seller is offering the unlocked F8131 model of the X Performance, which is compatible with AT&T and T-Mobile (with band 12), for $579.99 — or roughly the price of an unlocked Galaxy S7. The same model retails for $655 on Amazon and more on B&H and Target. Those do come with a limited 1-year warranty though, whereas the eBay one doesn't. Beware though that the eBay listing mentions a fingerprint sensor, but odds are very high that this won't be functional because it's a US model. The seller is well rated at over 98% positive feedback and will ship for free in the US and for a fee to different countries around the world.